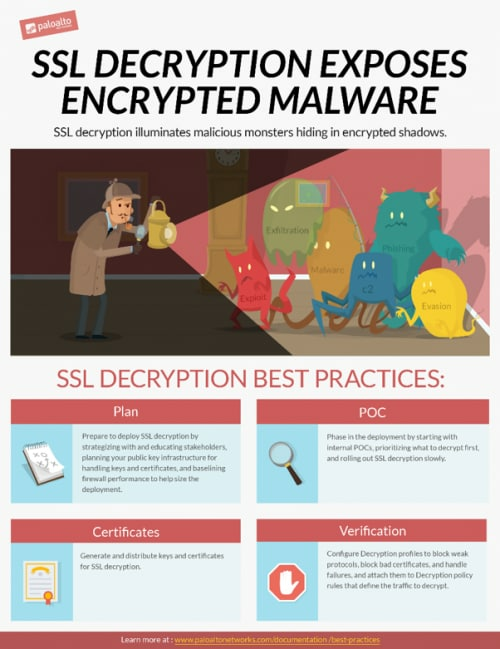 Take an enlightened approach to preventing malicious traffic from getting on your network by shining the bright spotlight of decryption on SSL encrypted traffic. Malware, exploits, and attempts to exfiltrate data hide in the darkness of encrypted traffic, where you can’t see them lurking in the shadows, waiting for the right moment to strike at your network and your most valuable data. Illuminate malicious traffic hidden in the shadows of encryption by decrypting it so the firewall can inspect it, apply threat prevention profiles to it, and send questionable items to WildFire for analysis. Decryption Best Practices shows you how to plan for and deploy SSL decryption, including preparing your network, company, and users for decryption, determining which traffic to decrypt and not to decrypt, handling certificates, staging the deployment, configuring decryption policies and profiles, and verifying that decryption is working. Use the best practice decryption advice to protect your network and expose malicious traffic hiding in the darkness of encryption. Thanks for letting us know! We’ve corrected the link.